Box Text: Battlefield explodes onto the Xbox for the first time ever with a bleeding-edge arsenal of vehicles and weapons. Engage in massive, adrenaline-soaked online battles, or go deep into a single-player campaign that drops you into a volatile conflict on the brink of an all-out war. 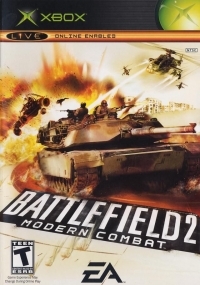 This is a list of VGCollect users who have Battlefield 2: Modern Combat in their Collection. This is a list of VGCollect users who have Battlefield 2: Modern Combat in their Sell List. This is a list of VGCollect users who have Battlefield 2: Modern Combat in their Wish List.